The quality of the marinara seafood mix from Melbourne’s fishmongers is currently outstanding. Yesterday, for a trifling few dollars, I brought home a half kilo container with fresh scallops, green prawns, mussels, calamari, salmon and white fleshed fish. The seafood pasta sauce came together in the time it took for the water to boil and the pasta to cook. We opened a bottle of riesling from the Clare Valley, a glass for the sauce, a glass for the cook, the remainder a perfect match for our meal. In the residual oil, sauté the garlic then add the wine. Bring to the boil, then reduce until almost evaporated. Add the tomatoes, return to the boil and simmer for 5 minutes. Return the seafood to the pan along with any juices, return to the pan to the boil, cook for 2 minutes then season to taste with sea salt and freshly ground pepper. Turn off the heat. i think i will try this one why not? thanks. drooling. Can you please courier a big bowl of this to me place? Please? looks like a fantastic meal! and what a great way to use the seafood! 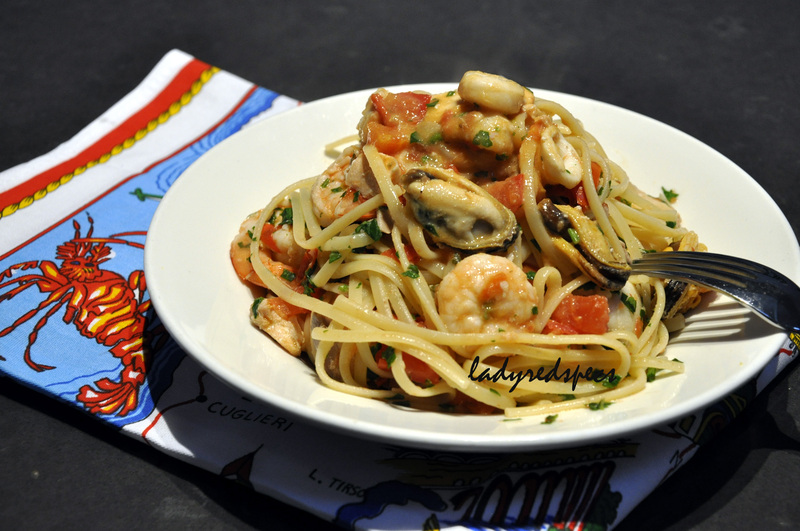 This entry was posted on November 11, 2012 by ladyredspecs in Food, Light Savoury Dishes, Main Meals, Pasta, Seafood Dishes and tagged marinara, pasta, prawns, seafood.